Paul typically gives his credentials at the very beginning of his letters (epistles) and this is no exception. He was “called to be an apostle” proving it wasn’t his idea but God’s. He was set apart (which is what sanctified means) for this very purpose. I love how Paul often thanked God for the church and the church at Rome is no exception. I have borrowed from this same idea that I customarily thank God for the church members there and do so to their face. He did this because news of their faith had spread into “all the world” meaning that they had very likely suffered severe persecution from being martyred, or having all of their earthly possessions taken from them and yet they still persevered in the faith. Here is clear evidence from Paul that He was the Apostle of the Gentiles as he said he was “under obligation” and as always, he was “eager to preach the gospel” to them. How many of us are eager to do the same to those who are still lost? There is a ton of theology in these tiny two verses. Paul wasn’t ashamed of the gospel and so I ask you and I ask myself, am I ashamed of it and show this by the sin of silence? That’s too bad because the gospel is its own power source. It is “the power of God for salvation to everyone who believes.” I have no power; the gospel does, we only have to unleash it. This gospel is “the righteous shall live by faith” or put another way, the righteous are saved by faith and that faith is in Christ. God’s wrath is revealed by the unrighteous who “suppress the truth.” The Greek word Paul uses for “suppress” is “katechō” and this means to physically “hold back, to detain,” or “to push down on” which is typically how the Greeks used it. It gives us the image of someone holding down or suppressing a coil spring. It is intentional so that’s why they are “without excuse” because they really know better. Why so? It’s because the invisible attributes of God, like the power that is found in nature, clearly demonstrate that a creation demands a Creator and it is really self-evident. They make a conscious effort to push back the obvious truth that God exists. This is why God gave them up to their own lusts of impurity and today, you can see in our culture how they dishonor their bodies and they dishonor them by their sexually immoral behavior and they have dishonored their own bodies because they were made in the image of God (Gen 1:26-27). Sadly, they exchanged the self-evident truth that there is a God and a higher, moral standard for a lie and now they worship or serve the creature (themselves and their own lusts) as they become their own idol, rather than the God who deserves to be worshiped as the Creator. What does Paul mean by writing “for this reason?” He was looking back at just what he wrote they dishonored their bodies by sexual impurities and then God said, “Okay, fine, I’ll give you up to your own dishonorable passions” but what were these “dishonorable passions?” It was women exchanging their natural relations with men for those of other women and or other men in adultery and fornication. For the men, in the very same manner, they “gave up natural relations with women and were consumed with passion for one another” (other men) and began immoral sexual relations with “men committing shameless acts with men and receiving in themselves the due penalty for their error.” This penalty is going to be incurred at the Great White Throne Judgment (Rev 20:12-15) because all who live in sexual immorality will have their part in the lake of fire (Rev 21:8). Another penalty is shortened lifespans as they suffer from more sexual diseases (i.e. STD’s) than monogamous married couples. Paul’s conclusion of chapter one is what he has been saying all along; they know of God’s righteous decrees yet do things that deserve death (for some a premature death) and even worse, they give their “approval to those who practice them” and this extends today even up to the Supreme Court rulings who now do what Isaiah wrote “Woe to those who call evil good and good evil, who put darkness for light and light for darkness, who put bitter for sweet and sweet for bitter” (Isaiah 5:20)! 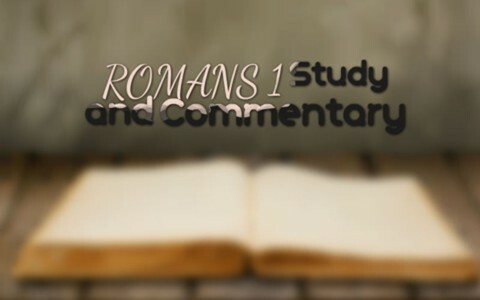 Romans chapter one has brought much controversy to the pulpits of the churches today. I’m not afraid to speak these things. Are you? Many are afraid to “cry aloud and spare not” because they don’t want to offend but the Word of God is supposed to cut in order to heal because it comforts the afflicted but it also afflicts the comfortable. The truth will set you free or it will make you really mad. I can live with both. I often hope that I will walk in to a church someday and hear a sermon preached like this! Reading God’s Word, with a little bit of commentary sprinkled in between the passages. This commentary can help the listener understand the message better. Sometimes I have even dreamed of walking in to a church and just having God’s Word read, without any commentary. Wouldn’t that be awesome?!!!! A preacher could admit that he or she cannot improve upon what is in our Holy scripture. Basically stating: I couldn’t have said it better myself. You are so kind Jim. The Book of Romans, like much of the Bible, is a bullion cube packed with power and it’s like swallowing an Alka Seltzer….it’s just truly potent. I think expository, verse by verse is always best as it captures the context, don’t you think? Yes, I agree. Expository, verse by verse, is the best way to preach. I wish more pastors would use this approach! My sunday school class is studying the book of Romans and this was why I ended up here. Wow so lots of findings. I am very well encouraged reading all of these. Thanks so much. My church is Grace Baptist Church Bowie MD. Where Pastor Mark Tauious and Pastor Brady Wolcott officiates. Thanks to you so much. sincerely yours, Stay blessed and keep not being afraid of what we are called to do. Amen. Thank you for such encouragment and it looks like you are very blessed with such good pastors and a rock-solid Baptist church. Previous post: What Does The Word “Maranatha” Mean In The Bible? Next post: What Does The Bible Say About Being Single?